Russian President Vladimir Putin’s efforts to re-establish Russia as a consequential world power appear to have borne at least some fruit: The prevailing view in a new 25-country poll by Pew Research Center is that Russia plays a more important role in international affairs than it did a decade ago. But increased stature does not mean being better liked. 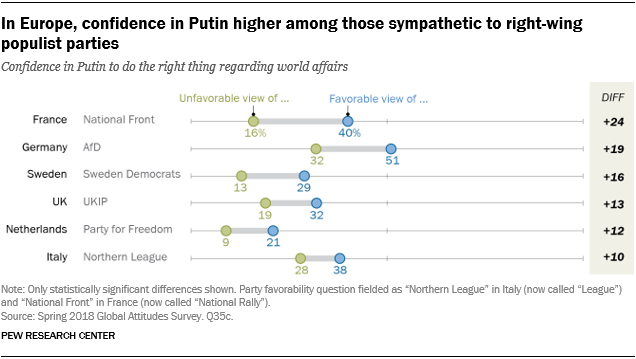 The same survey finds that views of Putin and the Russian Federation are largely negative. Globally, a median of just 34% express a favorable view of Russia, while about a quarter (26%) have confidence in Putin to do the right thing in world affairs. In only four countries – the Philippines, Tunisia, South Korea and Greece – do at least half have a positive view of Russia. By contrast, majorities in North America and much of Europe see Russia in a negative light. Attitudes toward Putin follow a similar pattern, with the Philippines and Tunisia the only countries where more than half express confidence in the Russian leader. These views notwithstanding, many say Russia’s international stature is growing. A median of roughly four-in-ten (42%) believe Russia is playing a more important role in the world today compared with 10 years ago. A smaller share sees Russia holding its ground (28%), while just 19% say Moscow’s influence is waning. Russia’s increased influence in world affairs is felt more in Europe, North America and the Middle East than in the Asia-Pacific, Latin America or sub-Saharan Africa. Among the countries surveyed, Greeks and Israelis are especially likely to say that Russia’s global stature has grown. 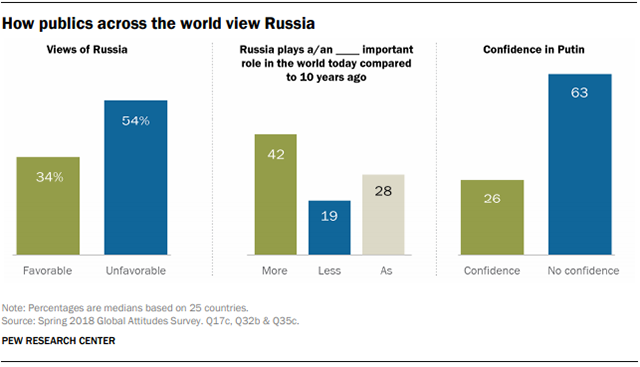 Russia is viewed more unfavorably than favorably in 16 out of 25 countries surveyed. In only four countries do at least half of respondents express a positive view of Russia: the Philippines (63%), Tunisia (55%), South Korea (53%) and Greece (52%). Views of Russia are especially negative in Europe and North America. In Europe, a regional median of 27% across 10 countries have a favorable opinion of Russia; in the United States the share is just 21%. Views of Russia in other regions are more mixed. In Asia, ratings are mostly positive in the Philippines and South Korea but are negative by more than two-to-one in Australia (63% unfavorable vs. 29% favorable) and Japan (68% vs. 26%). Views of Russia diverge in the two Middle Eastern countries surveyed, with 55% of Tunisians expressing a positive view of Russia, compared with just 34% of Israelis who say the same. In the sub-Saharan African and Latin American countries polled, many respondents do not offer an opinion about Russia. Favorable views are more common than unfavorable ones in Nigeria (41%) and Kenya (40%), while pluralities hold negative opinions in South Africa (44%) and Brazil (43%). In 10 of 25 countries surveyed, young adults ages 18 to 29 have a more favorable view of Russia than those who are 50 and older. Some of the biggest differences by age are found in Tunisia, Australia and Japan, where there is at least a 20-percentage-point gap between the views of the youngest and oldest adults. In Europe, a median of only 21% express confidence in Putin. In no European country surveyed do even one-in-ten respondents express a lot of confidence, while at least half in Poland (58%), Spain (53%), the Netherlands (50%) and Sweden (50%) say they have no confidence at all in Putin. Only in the Philippines (61%) and Tunisia (53%) does Putin enjoy the trust of more than half the population. A poor international image is not new for Putin. In the Asia-Pacific, Putin’s favorability ratings have remained low in South Korea, Japan and Australia over the past decade. The notable exception is the Philippines. Since Pew Research Center first asked the question there in 2014, confidence in Putin has increased dramatically from 38% to 61% as the Philippines has established closer ties with Russia while distancing itself from the U.S.
Public trust in Putin has remained low in Western Europe over the past decade. 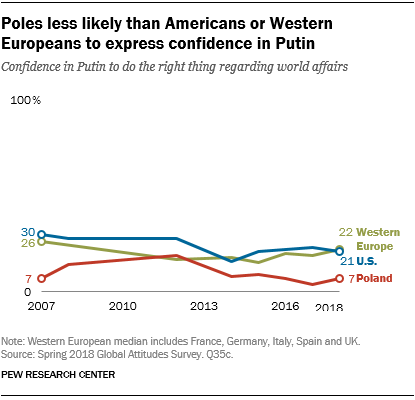 Poles have shown even lower confidence in Putin, with no more than about one-in-five expressing confidence at any point over the past 10 years. Over the same period, Americans’ confidence in Putin has eroded somewhat, from 30% in 2007 to 21% today. After differing by 11 percentage points in 2012, American and Western European views of Putin have tracked more closely in recent years. In the U.S., Putin and Russia are not popular among backers of either major political party. 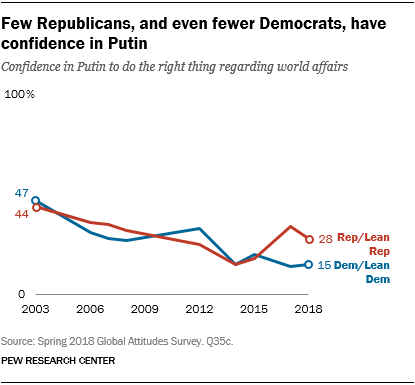 That said, Republicans and Republican-leaning independents currently have almost twice as much confidence in Putin to do the right thing as Democrats and Democratic-leaning independents (28% vs. 15%). A similar divide exists with respect to views of Russia: 27% of Republicans express favorable views of Russia, compared with 16% of Democrats. In six European countries polled, those who look favorably on right-wing populist parties are more likely to trust Putin to do the right thing in world affairs. Some of the highest confidence levels in Putin are found among Alternative for Germany (AfD) supporters (51%) and backers of France’s National Rally, formerly known as the National Front (40%). Roughly six-in-ten or more in Greece, Israel and Tunisia see Russia’s influence as increasing, while about half in France, the Netherlands and the UK agree. In the U.S., about half (52%) see Moscow’s influence as rising, but with a notable partisan division: 61% of Democrats see Russia as playing a more important role, while only 44% of Republicans agree.